Alabama head coach Nick Saban and the Crimson Tide are inside Bryant-Denny Stadium getting prepared for its first scrimmage of the spring semester at 1:00 pm CT. While it’s the seventh practice before the A-Day Game — which is scheduled for Saturday, April. 13 — it is the first piece of live game action for the players. With temperatures at 76 degrees and sunny, listed below are observations from warmups. -Saban is still trying to get the best five players on the field for the offensive line. -True freshman Evan Neal (6-8/360 pounds) was spotted taken reps at left guard with the first team. Emil Ekiyor was seen at right guard, with Matt Womack behind him. Saban has spoken proudly of the group thus far, but mentioned that he wants to see more consistency. -Quarterback lines remain the same with Tua Tagovailoa and Mac Jones working the group. Taulia Tagovailoa was behind Tua and Paul Tyson stood behind Jones. Jones has to show this spring that he has what it takes to run the offense. -There were three lines of wide receivers: DeVonta Smith led the group to the right (Z) and has Tyrell Shavers and Xavier Williams behind him. -The trio of Jerry Jeudy, Jaylen Waddle and Slade Bolden lined up in the slot, while Henry Ruggs III and John Metchie were to the left (X). -Cameron Latu continues to progress at tight end. He got a lot of positive feedback from Jeff Banks throughout warmups. Despite him being the last one in drills, Miller Forristall is happy to have Latu in the group. 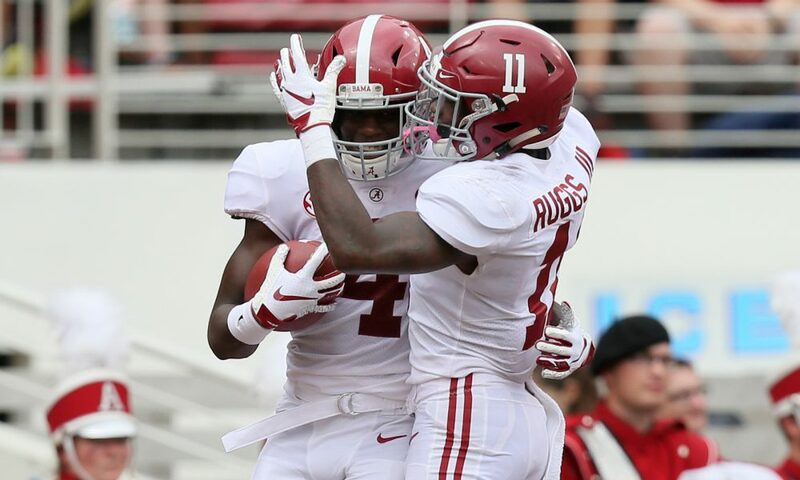 -As for running backs, the rotation with Charles Huff was Najee Harris, Brian Robinson, Jr., Jerome Ford and Chadarius Townsend. -Patrick Surtain II and Josh Jobe were the main two cornerbacks in drills, with Trevon Diggs and Nigel Knott behind them.